There’s more options for finger drummers out there than ever right now, and M-Audio fairly recently released their new Trigger Finger Pro. The more I see about this controller the more I like it. This video shows a great performance using all the original samples that come with the unit. The nice big display screen is definitely a nice feature and the built in step sequencer is a very cool feature. 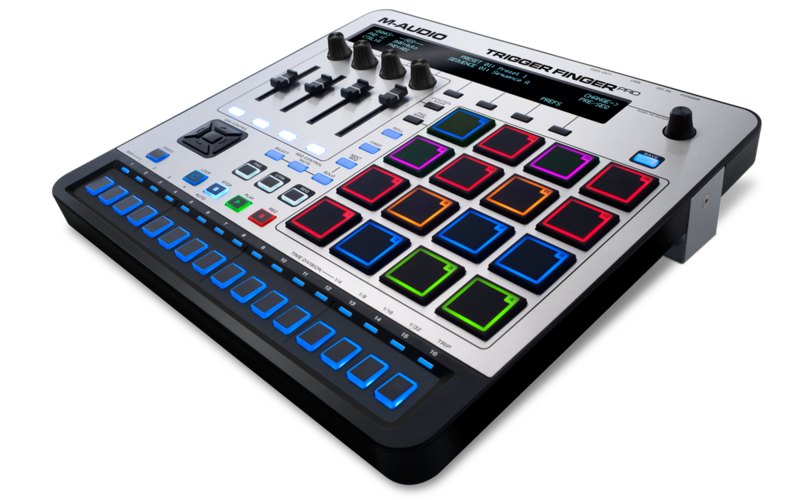 The only controller that seems to be in the same league as the TFP one is the Maschine, which is an amazing product. But the Maschine MK2 is $599, where as the TFP is only $199. I can’t comment on the feel of the pads themselves since I haven’t used one personally. But from what I have seen they look like nice sized pads and most comments about them have been good. This entry was posted in Bedroom Producer, Demos, Drum Machines, drums, Electronic Music, MIDI, Music Production, Video and tagged dj performance, dj performance controllers, dj performance music, dj performance tips, dj tools, dj tools acapellas, dj tools download, dj tools free, dj tools intros, dj tools samples, electronic drum set, electronic drums, electronic drums online, electronic drums project, electronic drums roland, electronic drums vst, electronic drums vsti, finger drumming, finger drumming exercises, finger drumming lessons, finger drumming patterns, finger drumming technique, finger drumming tutorial, m-audio, m-audio drivers, m-audio trigger finger, m-audio trigger finger mercadolibre, m-audio trigger finger midi controller, m-audio trigger finger pro, m-audio trigger finger pro hispasonic, m-audio trigger finger pro precio, midi hardware, midi hardware controller, midi hardware projects, midi hardware sequencer, trigger finger pro, trigger finger pro amazon, trigger finger pro manual, trigger finger pro precio, trigger finger pro traktor on March 26, 2015 by DemonicSweaters.